Well, after my collection of 'just this small pack of promarkers' started to grow and need space of their own, I flipped around using many different storage methods! From bags to boxes, nothing really hit the spot, I also was very reluctant, however nice, to purchase an overpriced storage holder from the makers themselves... So I did what I do best, I googled away and cast my eye on how other people stored theirs! 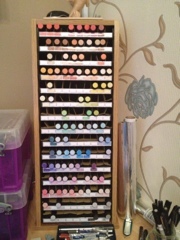 So no credit for this is taken by me, this is a fab and cheap idea and stores my markers perfectly! for the simple cost of a cheap DVD tower (ikea) and some blank DVD cases... A whole lot of love when Into the making of this, mainly because I found, when I took a pen out, the others rolled around in the row, so, although not totally visible on the pic, I made a concertina type sheet from cardboard which I could slot each pen into, keeping them firmly in place!